Two Adventist doctors--Gillian Seton and James Appel (a member on the APF Advisory Board)--who have been screening potential Ebola patients at Cooper Hospital in Liberia, are currently in the United States. Dr. Seton plans to return to Liberia, while Appel will be returning to Chad where he has worked for more than a decade. We feature Appel's book, Nasara, on the APF resource page. 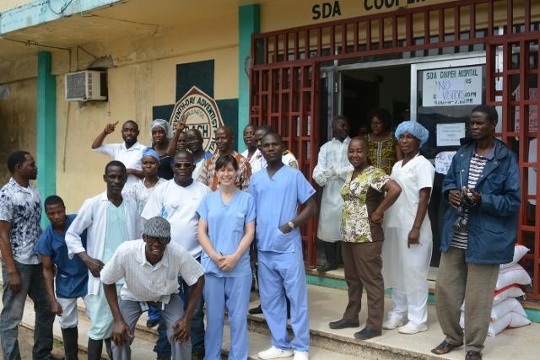 Dr. Gillian Seton, a 2008 graduate of Loma Linda, has served since February at Cooper Adventist Hospital in Liberia as a participant in the university’s Deferred Mission Appointment program. The program, developed by the General Conference of Seventh-day Adventists, provides financial support to medical and dental students committed to overseas mission service. Seton and Dr. James Appel were in Loma Linda recently to attend the Global Healthcare Conference at Loma Linda University and speak to community members. Lack of protective gear, few sinks for handwashing and little training in infectious disease control combine to make hospital work in West Africa dangerous, as this year’s outbreak Ebola takes its toll, according to Loma Linda University medical school graduates back from the continent. Seton and Appel bristle at the notion that Ebola can spread like a wildfire. NAD Social Media Campaign - The Ebola Crisis in West Africa (NAD). "The North American Division is starting a social media based funding campaign to support the fight against Ebola in West Africa. Adventist Health International manages two hospitals in Sierra Leone and Liberia. They are working to provide much needed health care for the people of this region. Please support the dedicated medial professionals and staff who are putting their own lives on the line to provide relief to those suffering in West Africa." Adventism, Ebola, and You (3ABN). "Due to soaring interest in our 3ABN Today Live program, “Adventism, Ebola, and You,” we have just posted this two-hour program on YouTube. Viewers can watch this fascinating interview with Dr. Peter Landless, director of Health Ministries for the General Conference of Seventh-day Adventists, as well as Dr. James Appel, and Dr. Gillian Seton, who have just returned from caring for patients at the Cooper Adventist Hospital in Monrovia, Liberia."